A form created for employees which documents their wages and deductions. Due to your employees by January 31. A form completed by employees upon being hired or if their status and/or withholding needs change. This form provides key information to the employer so that withheld taxes are appropriate. A form for new or renewing individual taxpayers for whom having a social security number is not an option. This form results in an individual taxpayer ID (ITIN). A form that is required for freelance or contract individuals, sole proprietors, and LLCs to whom the company paid $600 more in fees. The best practice is to obtain the form upon contract signing from each freelancer or contractors with whom you do work so you don’t have to scramble at year-end. From the information provided, it’s possible that a 1099 would be generated. 1099s must be mailed to contractors and freelancers by January 31. If you have any questions about these forms or how to complete them, please contact me. Until then, don’t tax yourself in getting all your filing done! When you started your practice you had time to do it all. You didn't have many clients in the beginning. You were fresh out of training to start your career. You had done all the legwork to get your business established. But now, your client list is growing, you need to do more classes, attend seminars, and do all the day to day stuff to keep your practice healthy and growing. An excellent way to delegate work is to hire a bookkeeper. This allows you to focus on what you do best, work directly with your clients. 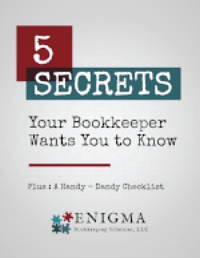 HOW DO I FIND AN AWESOME BOOKKEEPER AND FINANCIAL COACH?